November 2017 seems to be the month that may require from many of us some type of transformation, redefinition or reinvention. It may provide for us a fixed platform to unfold our activities, to develop in our old style our daily routine, but it could shake our life values and could make us feel intensely any new change. More than that we can navigate through November being passionate by what we are doing and nevertheless we can have a highly perception about things around us. However, during November 2017 we could be exposed to highly emotions that may redirect our mind to a much more open zone, one that could offer much more flexibility to see and to express our thoughts. The month starts with an energy that may cause irritation; conflicts, obstacles or in general with things not going our way. Hence, the first four days of November are challenging and may require us to become more patient in dealing with the various situations we area already involved in. Also, some adjustments may need to be done in order to avoid unnecessary stress or pain. Then, on November 4th there is a Full Moon in Taurus sign (11˚59”). The day of a Full Moon is the emotional culmination of the last 28 days. So, if you have experienced tension or if you were deep emotionally involved in something for the last 28 days, this day November 4th may unfold an answer for you, that could come from a high, intense emotion. Also, it might emphasize a new stable zone where you can feel safe and have love or material abundance. However, this full Moon seems to be more intense then other full Moon phases, because, in the same day, November 4th, the ruler of this Full Moon –Venus, will form a perfect opposition with Uranus (the witness of August Solar Eclipse). Suddenly events may appear that might force some of us to change the way we see or understand the material world and relationships in general. For instance this day may bring unexpected surprises in terms of money, like a decrease in the currency exchange rate. A similar aspect happened at the time when the Hurricane Harvey hit Texas last month. At that time, Venus was approaching Uranus by squaring it (a perfect square occurred on August 24th 2017). Harvey made landfall on the Texas Gulf Coast on August 25th. I consider this day one of the very important day of the month, in terms of values, everything that has a material form or even relationships. Going forward, on November 6th Mercury enters in Sagittarius, making us have optimistic thoughts. So we could extend our vision, our ideas and we could become more open-minded. Some of us may purchase travel tickets, while others couldn’t wait to close some deals/ contracts. However it will be, its looks like we are searching in different ways knowledge to improve our life and to understand the meaning of our journey. Then, on November 7th Venus enters in Scorpio sign and symbolically it could determine us to transform our values and rebuild our interest in relationships. Hence, we could approach deeply to the idea of change. On the other hand, Venus in Scorpio may offer us the possibility to see things behind the beautiful material form and nevertheless give us enough passion to explore the mystery of deep connections. Then, the most beautiful day of the month could be November 13th. It could show abundance, intense harmony and love expansion despite of any outside current, movements or unwanted circumstances. We could become over indulgent and we could approach deeply, even spiritually a specific subject of our life. Consequently we could transform our beliefs and we could have more trust in our individual capacity, in the power of creation (Venus will conjunct Jupiter / 7˚ Scorpio). Despite this, the harmony of the day could be disturbed by a tension or some stressful energy that could come in the form of messages, communication and could relate to our long time dreams and ideals (Mercury square Neptune). Additionally, during this day, it will be necessary for us to consider a minor adjustment in order to understand fully the changes that we may have to do, even if is just about ideas and plans (Mercury sesquisquare Uranus). On November 18th there is a New Moon in Scorpio (26˚19”). New Moon very often offers us possibilities to open a new chapter of our lives. It shows the time when we can set up our future intentions. This New Moon being in Scorpio it may require some deep transformations or changes before a new life step. So pay attention to the zone where this new Moon will fall in your natal chart. Then on November 19th we have one of the hardest aspect of the month. Mars will approach to Pluto by squaring it. This is a cardinal square that can be associated with instigation or initiation. However, the day may shows some short type of enthusiasm, courage to act promptly, but taking in consideration that this aspect is between Mars and Pluto it could be more delicate or even difficult to move in the right way. So it might be necessary to adjust your life pace and pay attention to the zone where you already acknowledge some blockages that may depend on external factors. All of us have Pluto transiting some important zone of our natal chart and all of us have Mars transiting an important zone of it. So elements from these two zones will be in question and could challenge us. At a universal level this could also be a challenge, because Mars is the planet of war and aggression, and Pluto over controls and regenerates anything it touches it. More than that, the energy of this day November 19th is generated and coordinated by these two planets Mars and Pluto, because Sun is still in Scorpio, and Mars and Pluto rule the Scorpio sign. 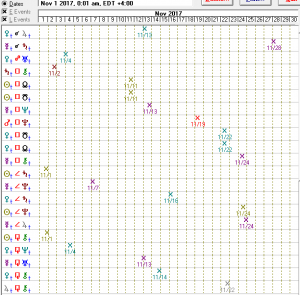 Going forward, November 22nd could be an intense day, and it could contain a mix of energies. It’s a day of switch. For instance, some old elements or people from our past may appear in our present and it could challenge our attachment, love or even relationships. In the same time new values or a new people may appear in our present and could challenge our future plans. (Venus square both NS and NN). Also, during this day Jupiter sesquisquare Chiron and it may trigger that feeling of mild irritation and frustration. Then, on November 22nd Sun enters in Sagittarius offering us optimism to fight for what is right for us. Symbolically it could open a wide zone of manifestation, even offering opportunities to explore more, to learn more in order to expand our word view. Hence, Sun will past through Jupiter sign, while Jupiter is transiting Mars and Pluto’s sign – Scorpio. This planetary placement may require us to understand the deeper layer of our world, to transform our belief system and even to regenerate our emotional system. The secrets that could be revealed during this month might have a beneficial impact on us, and automatically could eliminate the darker things that could slow down our regeneration process. In the same day November 22nd Neptune goes direct (11˚28.0” Pisces). It was in the same degree in February 2017 around 23rd/ 24th. Neptune symbolically could allow us to approach closely to the Universal truth, to comprehend our spirit values and nevertheless could stimulate our imagination to dream far. Some of us might feel this energy, one that could be wonderful especially if you are spiritual or believe in dreams. You could connect or synchronize your soul to the source where it comes from. In the last part of the month, there are several minor negative aspects that could play with our patience, and that may bring here and there some frustration and minor obstacles. However, at the end of the month, on November 28th Mercury will conjunct Saturn. This day could bring inhibition especially in terms of communication, self-expression. So some of us might have difficulty in dealing with others, even it could be difficult to express our thoughts. Also there could be some distant attitude towards others and this may cause rejection. On the other hand, at a very personal level it could determine some of us to be introverted. Reality may create fears, and ultimately anxiety or even depression. So be patient with you. To conclude, on November 2017 we will be required to look into our values, to things matter to us and to select the things we want the most. It’s the month of regeneration, the month that could set future intentions, the month that may offer different versions of our life. Wishing you all a very Happy Month and Happy Thanksgiving!